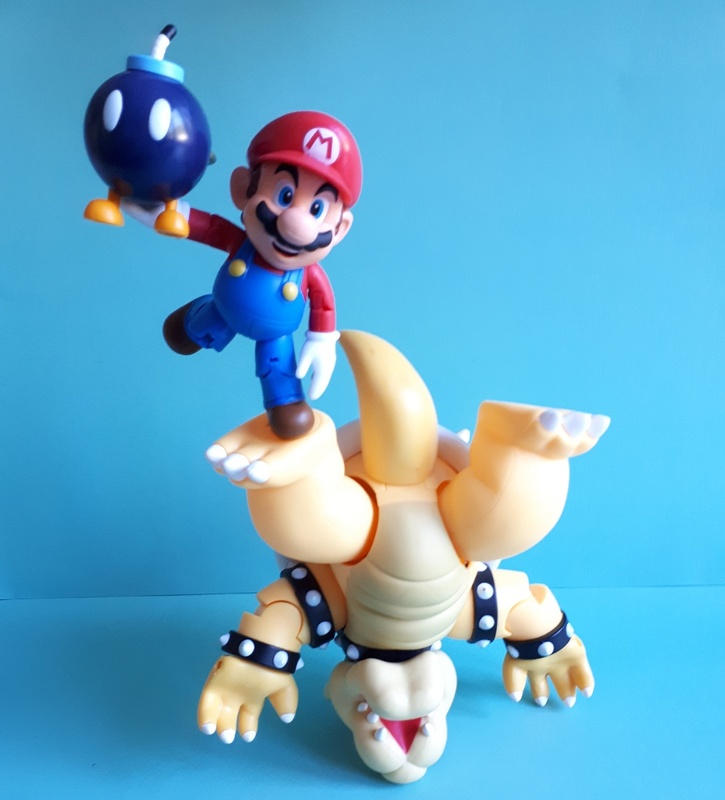 There have been many great rivalries throughout the history of video games, but none is perhaps as well known as that between Super Mario and Bowser Koopa. Since the pair first began their feud back in the Fall of 1985, it has shown no signs of slowing down as the famed pair of Nintendo mascots seem to be destined to do this forever - with the fate of the Mushroom Kingdom hanging in the balance every single time. Yes, the rivalry between Mario and Bowser stands as one of the greats, and for their latest release, the fine folks at Jakks Pacific are bringing the feuding foes to you in a new diorama set. 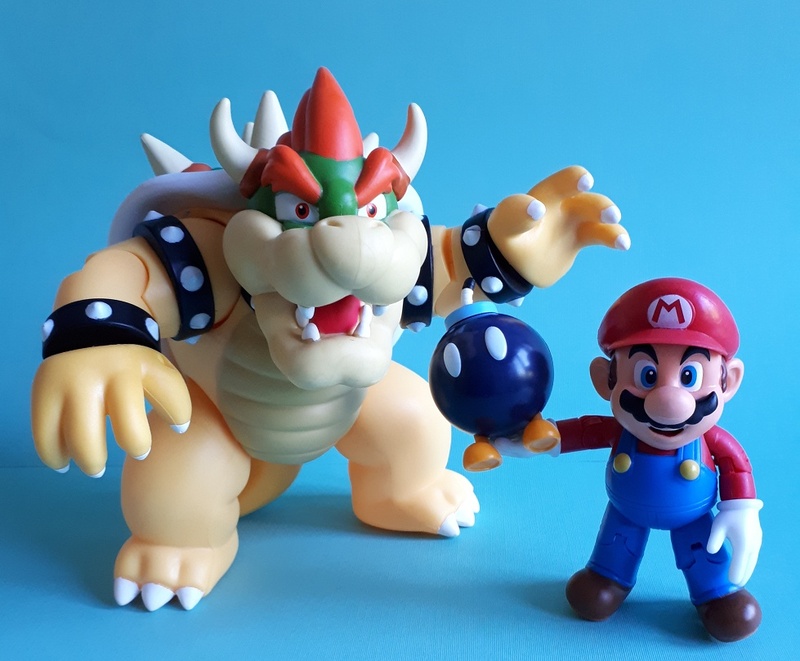 Known as the Bowser Lava Battle Set, it not only includes a re-release of Mario and a Bob-omb, but brings back the very impressive Bowser Koopa figure released all the way back in 2014. The World Of Nintendo Bowser Lava Battle Set comes to you in some very nice collector friendly packaging. Like the regular releases in this line, it's bright and colourful with all three of the included action figures clearly displayed within. The floor of the packaging resembles the stone walkways of Bowser's castle, while the reverse gives you a brief write-up about the set and the figures within. This gives collectors the option of displaying the figures in a diorama setting, but while this is a very cool little extra, it's the trio of figures within that makes the set really shine. First up, we've got Super Mario. He stands 4" tall, and is a re-release of the most recent open-handed version of the character that we've been seeing since last year. He comes to fans in his trademark blue overalls and red cap, and features some very vibrant paint work throughout. As with the previous Super Mario figures that we've seen from Jakks Pacific, this one features a smudge free coat of paint made up of crisp lines and even applications. The facial expression is classic Mario, made up of his iconic moustache, a wide smile and bright, shiny eyes. The figure bolsters all the same points of articulation that we've seen before - including movement in the head, shoulders, elbows, wrists, thighs, legs and knees. Everything is good and tight out of the box, which is nice given that one would expect some joint fatigue given the number of Mario figures that we've gotten from Jakks Pacific over the last five years. Fortunately, as this is a straight-up re-release of the newer Super Mario figure first released back in 2017, the mold has yet to suffer from the passage of time and features a very solid feel throughout. As with the Raccoon Mario we looked at back in May, this figure is very easy to pose. Every joint moves nice and smoothly, and we had absolutely no issues pulling off each of the desired looks for it in each of the pictures used for this review. But, Super Mario is just one of three impressive pieces making up this set. Jakks Pacific has also included one of the 2.5" Bob-omb figures in this set. Looking as they always do, this explosive little guy features a rotund, bluish-black body sporting orange feet, white eyes, and a fresh wick poking out the top of his head. Interestingly enough, while the Bob-omb doesn't really feature anything in the way of articulation, Jakks Pacific have included a golden key in his back that twists. Now, given that the key doesn't activate anything within the figure, like a walking feature, it was completely unnecessary to make the key moveable. However, it is one of the coolest little features that we've seen in a figure of this scale, and can't praise the artisans at Jakks Pacific enough for deciding to go the extra mile and throwing in this nice little extra. 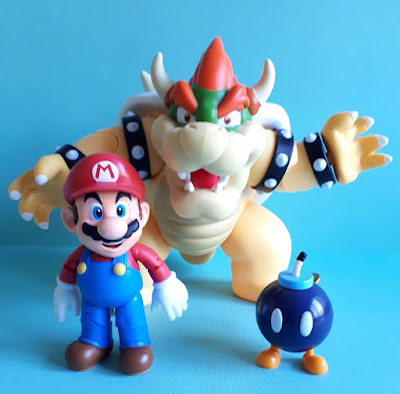 There really is nothing more to say about the Bomb-omb, but we just love the fact that he's in scale with the larger figures in this set and, as you can see in some of the pictures posted below, he can actually fit rather nicely into the hands of the larger figures. The highpoint of this set comes in the form of the hulking 6" Bowser Koopa figure! We've not seen this guy released into stores since 2014, and he's quickly become one of the most popular figures within the World Of Nintendo line to date. 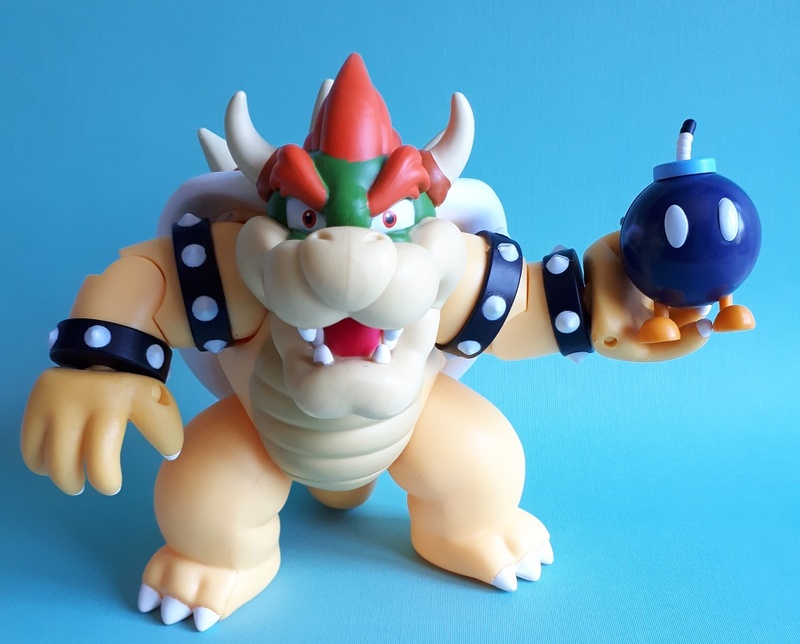 Now, given his popularity and limited release, the original Bowser figure has skyrocketed in price since his initial release. When it first hit stores, you could snag the Bowser Koopa figure for a mere $15, but now you'd be lucky to find one for under $89 on the secondary market - and trust us, we've tried to find him cheaper. Now, while we praise the World Of Nintendo line for its excellent price point, that is just far too much to pay for one of these figures - even one as coveted as Bowser. Realizing this, Jakks Pacific has re-released the original figure into this set, and it's just as awesome as we'd hoped. Looking as though he just stepped out of New Super MarioBros. 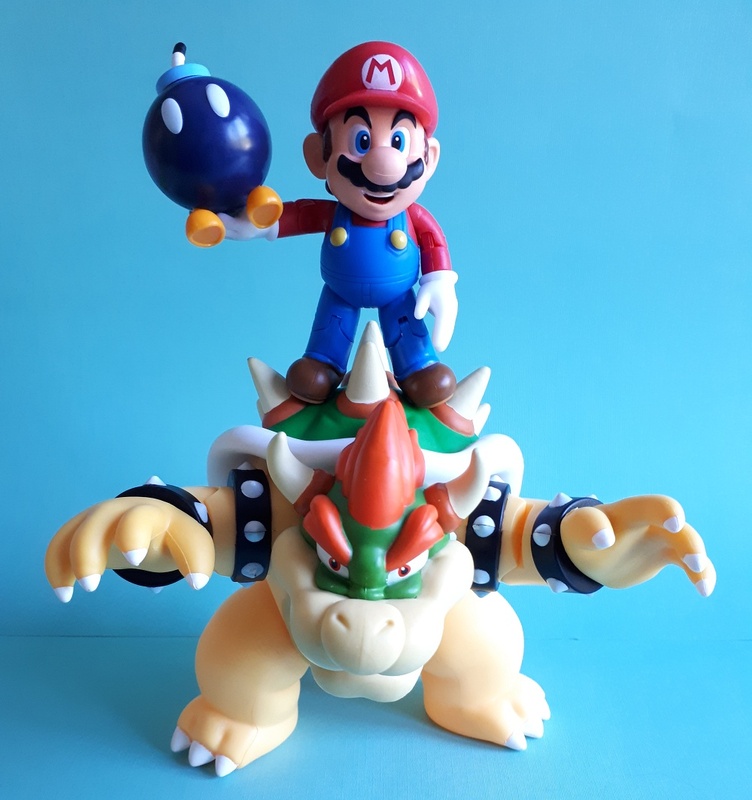 Wii, Bowser towers over the other two figures in this set at 6" tall. He's hefty, chunky and feels like a real high quality piece of plastic. Bowser features a gorgeously crafted shell bristling with spikes, a fiery red quaff of hair, matching eyebrows, a toothy grin and his trademark studded bracers. He's brightly colored and features some beautifully clean paint work made up of varying shades of yellow, green, white and red. As one would expect, the paint applications here are nice and clean. 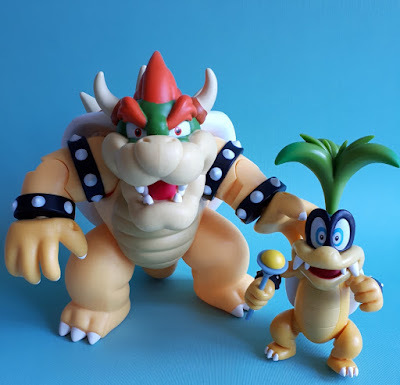 There is no evidence of smears or smudges to speak of and, while this paint job doesn't feature some of the depth and detail of some of the more recent figures in line, like Iggy Koopa, it does the job and the end result is most pleasing to behold with the eyes. 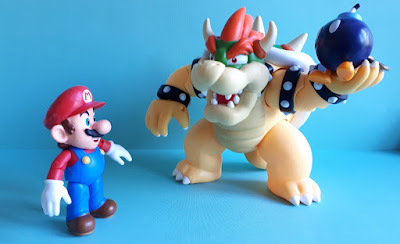 There is also a descent amount of articulation spread throughout the figure, but this is the one area where Bowser feels a little dated in comparison to some of the more recent World Of Nintendo figures. He features movement in the shoulders, elbows, wrists, thighs, tail and head. Each joint feels strong and tight, but we will admit that movement in the head is somewhat limited due to the massive shell dominating the majority of his back. Still, while he's not the most flexible figure to be released in the line, we will admit that the level of articulation feels appropriate for a figure of this size and price. 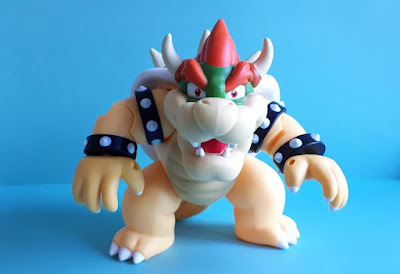 And, despite the limited motion, when you combine it with the strong sculpting and paint applications, Bowser is still a really great figure in his own right. And one that fans are certain to want within the ranks of their collections. Like we said above, the World Of Nintendo Bowser Lava Battle Set is an essential piece for Nintendo fans! 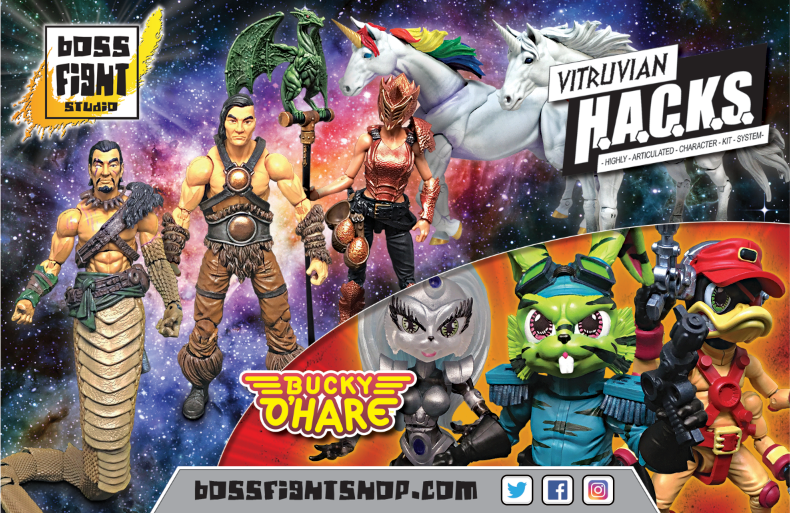 Jakks Pacific has knocked their first diorama release out of the park by presenting fans with the ultimate video game rivalry - and at a much more affordable price. The World Of Nintendo Bowser Lava Battle Set features three extremely well done action figures and finally offers fans a second chance to own the simplistic, yet still very cool, Bowser figure from back in 2014. Sculpting, detail and paint are all top notch for this price point, and we can't wait to see how Jakks Pacific will be expanding upon their diorama series in the future. Additionally, we can't help but feel that this new set is the perfect starting point for fans and collectors looking to break into the World Of Nintendo line for the very first time, given that you can snag two heavy hitters and a very cool Bob-omb accessory for under $40 here. 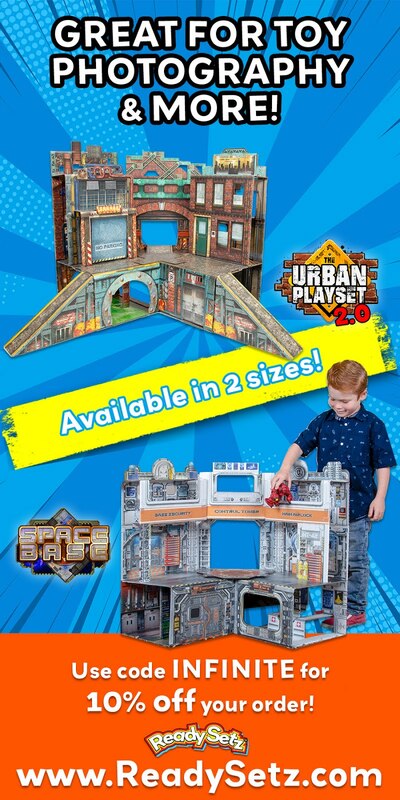 So, all in all, we feel this new set is another win for Jakks Pacific and the World Of Nintendo line. We honestly have no complaints about this one, feeling it is one of the very best releases in the World Of Nintendo line to date! It's tonnes of fun and, for those of us who grew up during the heyday of Nintendo gaming, it's pretty much a dream come true! 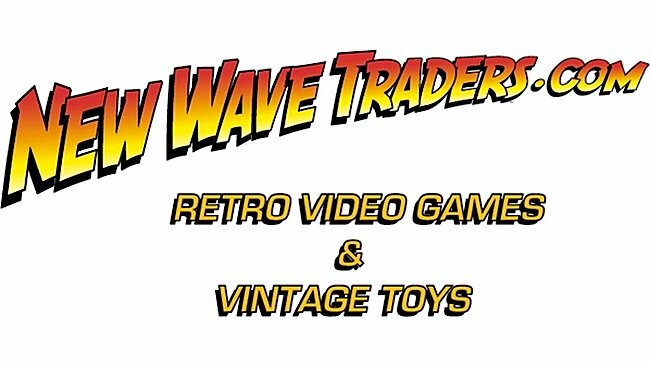 Keep up the good work, Jakks Pacific! We can't wait to see what's next! 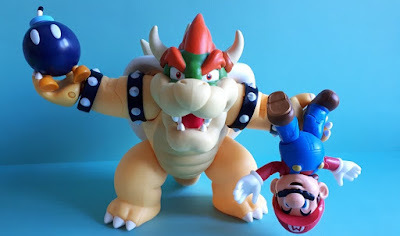 Overall: "The essential figure set for Nintendo fans, Jakks Pacific brings back a fan-favorite and slaps him into a multipack that serves as a great jumping-on point for those wanting to experience the World Of Nintendo line for the first time!" 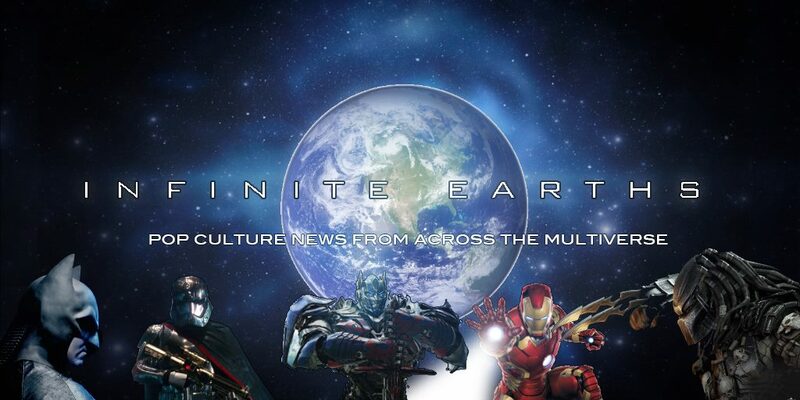 - Special thanks to Kopper Overton over at Jakks Pacific for sending the sample used in this review! And to Katie Passfield for taking the pictures used in this review!